The "Make Money Marketing" Course for Bloggers is Coming! Hey everyone, I'm so stoked to let all of you know that I've officially started crafting the Make Money Marketing course from the ground up! As all of you know, blogging and making money online is one of my absolute passions in life (right up there with writing about personal finance). You probably also know that I had only been blogging for about 6 months when I decided to leave my full-time teaching job and pursue running this site full-time! The only (and I very seriously mean only) reason I was able to “make it” in this business while M$M grew was by using the skills I picked up blogging to land digital marketing clients. There are so many small business owners out there right now that need someone to manage their social media, do email campaigns, Facebook ads, website management and so much more. However, they typically don't have the staff, know how, or budget to hire a larger marketing firm. Most bloggers know that it's not easy to make money at first with your blog. Affiliate income is incredible, but it can take months or even years to really build a strong income stream. Ad revenue sounds great, but you have to have massive amounts of traffic to make significant money (anyone who has slapped Google ads on their site and received a cool $1.13 after three months has experienced this haha). The moment I realized that blogging and marketing went hand in hand, everything clicked for my business. Since then (not even three years ago), I've made well over $100,000 from my laptop this way. No big business to run, debt to get started, or need to manage employees. Think about it – running a blog of any kind or with any size audience essentially makes you a grass roots marketer. You have to capture email leads and create email campaigns, push your message on various social media platforms, push products, create content, manage the technical aspects of a website, etc. 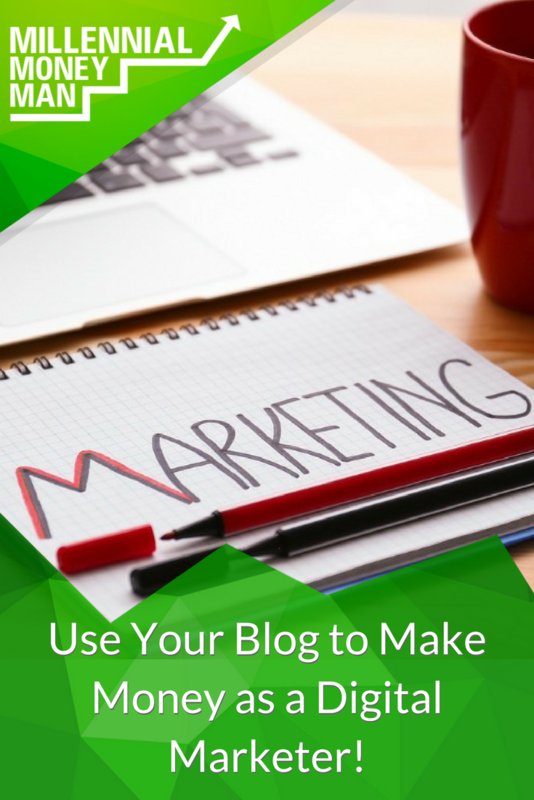 A blog is a perfect portfolio for landing a great digital marketing gig – you just need to know how! My goal is to make it easier to create a solid income stream for anyone that successfully runs a blog of any size. In addition, the course will include a generous affiliate component that you can add to your affiliate portfolio to boost your blogging income! Lastly, if you're a small business owner that wants to manage your own marketing efforts or learn what you should be paying and getting for marketing services, this course will also be incredibly valuable for you as well. What would you like to see covered in the course that I didn't list? Woohoo! Looking forward to learning from your experience and hopefully gaining some valuable clients! Yeah you’ll like it! Going to pack as much as possible into the course! Good work Bobby, can’t wait to see the course! Awesome! Can’t wait for the program to go live. I’m sure there will be a ton of content in the course that will help a lot of us with the marketing for our own blogs as well! Save us a spot! Signed up last time. Can’t wait to take your course. Excited to get started. I’m hoping to launch in mid-October! I’m really looking forward to this course. I’ve seen so many ads for blogging courses that promise leads and 6-figure income, but I shy away because I rarely see specifics on the WHAT and HOW before purchasing. Kudos for laying it all out and being transparent! No problem! Yeah, I think there are a lot of courses out there that are all sales pitch and no substance. The more info about the course I can get out there, the better IMO. I am soooo excited for this course! You’re offering such great insights and tips, several of which I wouldn’t have thought of right away for digital marketing! Thanks for making an awesome tool! Awesome! It’s crazy how closely related the two are (blogging and digital marketing). It’s all about framing it in the right way to land clients. Looking forward to this one! I neglected affiliate for too long and left money on the table, but I have “seen the light” and look forward to learning from you. Count me in as an early investor. Bobby! This is awesome. I’ve been earning a decent amount of revenue via marketing for small businesses. My main problem is knowing how much to charge for what service. Looking forward to seeing what you put together! I definitely want to start my own personal fiance/lifestyle blog in the upcoming months. I dont know anything about online blogging or the sorts,but I trust that with your course I can start off on the right foot and get the ball rolling. I just want to thank you now for being an inspiration and sharing your story with us all. No problem! Yes you should definitely take my free blogging course – I packed it with a ton of great information about blogging.